For some reason I’ve been drawn to risotto entrees lately. I don’t know if its the creamy texture, the simplicity of a gourmet dinner in one pot, or the endless possibilities to be explored. Regardless, here’s another recipe for a barley risotto. This one was good, but I have to say, I liked the other barley risotto a little better- depends on if you’re in the mood for eggplant or not I guess (but don’t get me wrong, this dish was delicious, too). Combine eggplant, tomatoes, 2 TBS oil, and 1/4 tsp. pepper in a bowl; toss to coat. Arrange mixture in a single layer on a jelly-roll pan. Bake for 20 minutes or until tomatoes begin to collapse and eggplant is tender. Heat remaining 1 TBS oil in a large skillet over medium-heat heat. Add onion to pan; saute 4 minutes or until onion begins to brown. Stir in barley and garlic; cook 1 minute. Add wine; cook 1 minutes or until liquid almost evaporates, stirring constantly. Add 1 cup broth mixture to pan; bring to boil, stirring frequently. Cook 5 minutes or until liquid is nearly absorbed, stirring constantly. Add remaining broth mixture, 1 cup at a time, stirring constantly until each portion of broth mixture is absorbed before adding the next (about 40 minutes total). Gently stir in eggplant mixture, remaining 1/4 tsp. pepper, and salt. Top with cheese, basil, and nuts. this looks delicious, i never realy stray from mushroom risotto so i really should have a go at this! Risotto is one of my absolute favorite dishes. This looks amazing, I love all the colors. 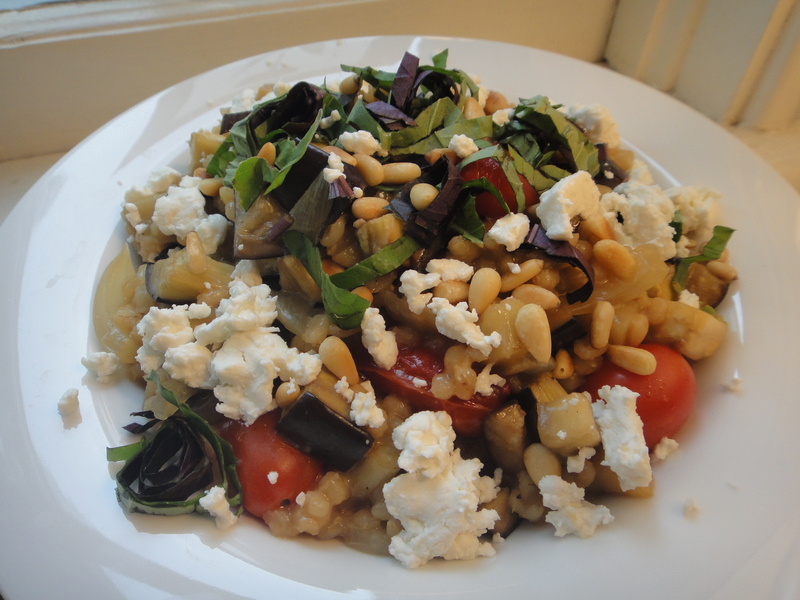 And it’s such an interesting twist, I’ve never tried using barley and goat cheese. I love how this is just bursting with cheese and veggies and other good stuff. One can’t have too many risotto recipes.